It was at the end of October 2018 that Ricoh announced the new Ricoh WG-60. Even if it’s quite similar to the previous WG-50, the new model gets to stand out with the waterproof, crushproof, dustproof and shockproof construction. 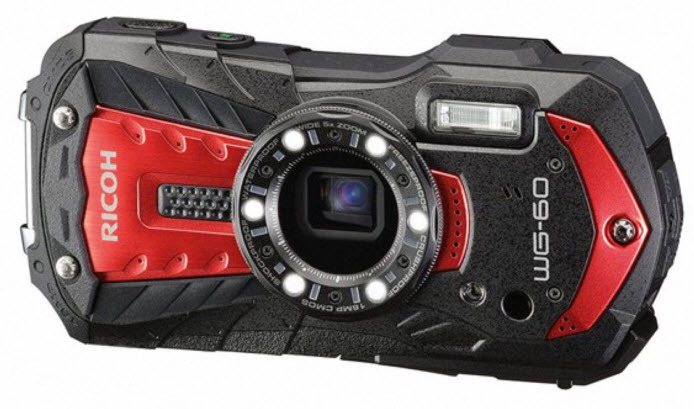 It’s a 16MP point-and-shoot outdoor digital camera that is both affordable and reliable for the outdoor enthusiasts. What’s the short description of Ricoh WG-60? Designed for underwater photography down to 45ft. (14 meters), the Ricoh WG60 ensures waterproof and shockproof performance. It has a compact and lightweight build and its waterproof and shockproof are astonishing. The camera makes a great first impression as its design isn’t just functional, but also nice looking. Don’t let the lightweight body mislead you as the RICOH WG-60 is able to outperform many of the digital cameras and smartphones in challenging outdoor situations. Not only that it’s waterproof up to 45ft., but it’s also able to handle a fall from a height of 5.24 ft. (1.6meters) and take temperatures as low as -500F (-100C). On top of everything else, the camera comes with outdoor-friendly LCD monitor so that you may adjust the brightness to the lighting level in any shooting situation. The RICOH WG-60 brings a lot of good things to the table and we need to go over the details in order that you understand why this camera is the perfect addition for any outdoor enthusiast. The camera is able to perform underwater shooting down to 45ft. (14meters), for maximum 2 hours. It presents an airtight and tough body, waterproof down to the depth of 45ft. (14meters) and it has an equivalent of IPX6 or JIS Class 6 rating. It’s also free-proof to temperatures as low as -50F degrees (-10C degrees). It’s even crush-proof against weights up to 100kgf. The amazing heavy-duty construction is the reason for which the RICOH WG-60 is reliable and high performance in most challenging and harsh outdoor conditions. The RICOH WG-60 isn’t just a tough body, but also a camera that provides beautiful pictures. It comes with a back-illuminated CMOS image sensor and provides great high-sensitivity and low-noise characteristics. It ensures high-speed read-out of image data signals. The high-performance imaging engine helps the image sensor present high sensitivity of ISO 6400 and high-resolution images of 16MP. The camera ensures advanced image processing function and the super-resolution technology that gives clear, sharp and high-resolution images. The RICOH WG-60 comes with new features such as Handheld Night Snap mode, which is going to automatically capture different images of the same nighttime scene in order to create just one blur-free and composite image. When you’re selecting the Digital Microscope mode, six LED Macro Lights (placed around the circumference of the lens barrel for macro shooting) are going to help the camera to give even and bright illumination of the subject. The Macro Lights let you see a magnified view of the microscopic world really clearly. You’re going to be able to capture impressive close-up images. The Instant Illumination Enhance function is going to reduce camera and subject shake, which results into a higher shutter speed. The automatically raising of the discharge level of the Macro Lights when the shutter is released is made thanks to this function. The Macro Lights offer plenty of other useful functions, such as Self-Portrait Assist mode. In this mode, a blink of an LED lamp is used to check if the face of the subject is really captured within the picture frame. You’re also going to be able to use the camera in the dark as the Macro Lights are going to sustain the LED lighting mode. The RICOH WG-60 comes with five-times optical zoom lens that have a focal length coverage 0.59in to 0.98in (from 5mm to 25mm). this is going to allow the camera to cover a great variety of scenes and subjects, landscapes including. It also comes with other comfortable shooting functions. For instance, the macro mode is going to help you capture amazing close-up images from a minimum focusing distance of almost 0.39in (1cm). the Intelligent Zoom function is going to expand the zoom range to almost 36 times, without ruining the image quality, which is important for the high-quality telephoto photography and interval-shooting mode which is really helpful for the fixed-point observation. Bear in mind that the RICOH WG-60 also ensure Full HD movie recording with H.264 recording formant. You may capture high quality extended movie clips (1920×1080 pixels, 16:9 proportions) at 30fps. In order to add some nice touches to your movie recording, the RICOH WG-60 also comes with high-speed camera function so that you may slow motion playback of your captured movie clips and an interval movie function. The micro-HDMI terminal (Type D) is going to sustain simultaneous output of Full HD movie clips and also sound to external audio-visual devices. As it’s created especially for the underwater photography, the camera includes Underwater and Underwater Movie shooting modes which are going to improve contrast and color, according to the data of images captured under the water. The modes are going to create sharp and realistic images by improving the shades of red, which are typically lost in underwater photography. They also compensate the loss of contrast due to the diffusion of light in water. You can also use the Flash Off+ and Flash On options with the Underwater mode, so that you may capture two images with just one shutter release- one with flash and the other one without flash. If the camera identifies low-lighting conditions in still-image shooting, this specific mode is going to raise the sensitivity automatically up to as high as ISO 6300, so that you may use a higher shutter speed and reduce the adverse effects of camera shake and subject shake. This shake-reduction mechanism is going to compensate for camera shake when you’re recording still images. This is done by processing the affected images in a digital way. If you’re movie recording, this particular mode is going to compensate for the poor alignments of images due to camera shake. The software is going to create amazing and blur-free movie clips. The RICOH WG-60 comes with a 2.7in LCD monitor with horizontally 16:9 proportions and 230,000 dots (give or take). The monitor’s AR (Anti-Reflection) coating is going to reduce the glare and reflections for a clear and sharp on-screen image even in bright sunlight. The camera also comes with other features such as the Outdoor View Setting mode which is going to set the best monitor brightness level for a specific lighting situation. High-speed Face Detection function which allows the camera to capture up to 32 faces in focus in just 0.03 seconds. 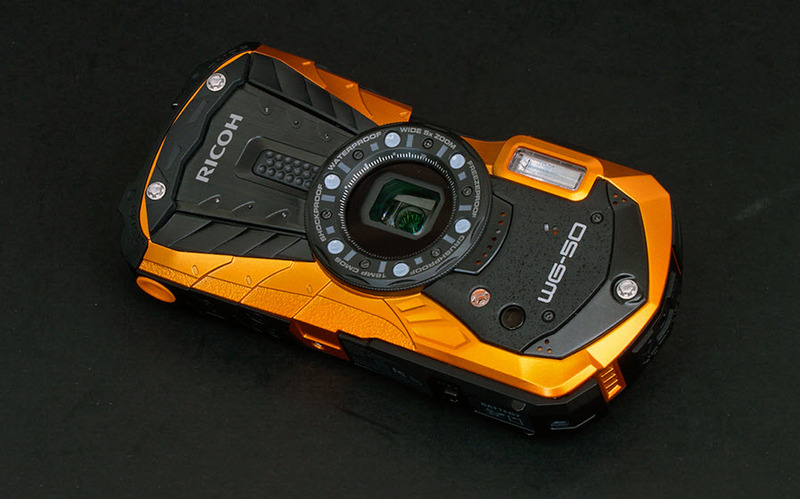 Rugged, tough, waterproof, shock proof and even freeze-proof, the new RICOH WG-60 is going to be a reliable camera for the underwater shooting. The image quality doesn’t disappoint and its price isn’t going to empty your pocket. It’s a good camera that is worth every single penny, any given day.